It is always bittersweet to write my annual letter at the end of each summer. August brings some of the hottest weather, and therefore a time when I&apos;d rather be inside enjoying an encore performance of our annual Gilbert and Sullivan show. Unfortunately, the show always has to close at the end of July, no matter how phenomenal our performers are, and we all go back to our day-to-day away from the Wortham. But I&apos;m so proud of what we did! Our show would not have been able to come alive without the reconstruction of the historical Ida set from the D&apos;Oyly Carte company, purchased by the Society in its early days and damaged by water during Hurricane Ike. Thank you to all of you who donated and made this restoration possible! Members of I.A.T.S.E. Local 51 worked tirelessly over three weeks to make the magic happen. Please watch this time-lapse video to see their work in action! Our production of Princess Ida was a critical success. 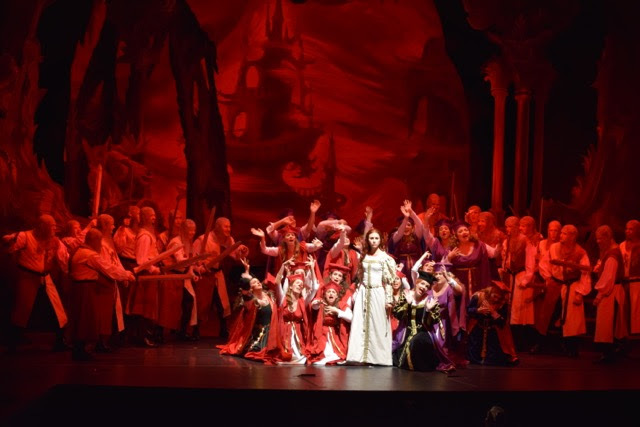 We heard from reviewers and audience members alike just how much they enjoyed the performance and truly appreciated being able to see this lesser-known gem of an opera. There are several things absolutely necessary to any successful production of Gilbert and Sullivan. The ability to sing, and sing well, is understood, and here the company does not disappoint. In fact, they delight. But that is not enough. They must sing and recite the most ridiculously outlandish material as if they were doing KING LEAR. Absolute, straight-faced dedication to the idea of topsy-turvy must be adhered to at all times. There must be no self-awareness. Again, no problem. The company shines in this endeavor. While those who saw the show agreed that it was an artistic success, Ida didn&apos;t perform as well as we would have hoped financially. The show&apos;s length, with a large cast, costume and set changes, increases the cost of staging it. Higher costs mean it&apos;s less likely companies will perform it, making it less recognizable, and less likely that people will decide to see the show on name recognition alone. We did not turn a profit on Ida, and we hope that your support of continuing the G&S tradition in Houston will help sustain us long-term. We&apos;ve just begun our next fiscal year, and would love to be able to start it off on the right foot. Your donations now will count towards your contributor status next spring for priority seating for 2017&apos;s summer show. Even in the face of our own financial losses, we are dedicated to supporting the arts in Houston, especially through our young performers. Our scholarship programs assist young singers and technical theater students through college and provide them with developmental experiences they could not achieve otherwise. Help us help them by attending our annual evening of Songs for Scholarship Support on Saturday, Sept. 17 at 8 p.m. at MATCH theater in Midtown. Former scholarship winners will perform alongside Society favorites, with proceeds going to our future programs. We hope to have a full house ready to see this young talent in action! Thank you for your support through another summer. We&apos;re already planning for our annual meeting in October and another special concert evening starring Alistair Donkin on April 8 at HBU - with a potential for a Society premiere! We hope to see you soon! P.S. We&apos;re always happy to hear from you and love making new friends! Drop us a line at board@hgns.org. If you&apos;re interested in getting more involved, fill out our volunteer form and someone will get back to you about upcoming opportunities.